Y Bwthyn is now available for rental. If you are looking for that luxury cottage situated in an area of outstanding natural beauty with magnificent sea views we have it. 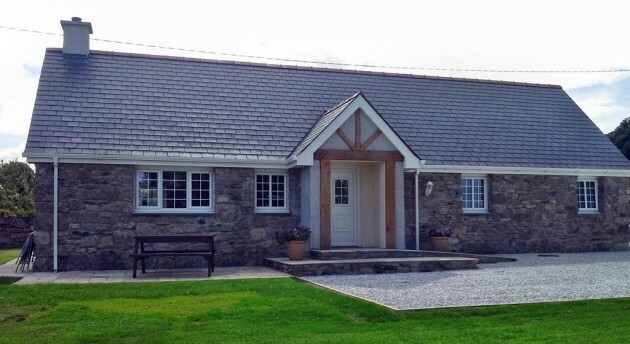 Y Bwthyn is a single storey stone cottage with two ground floor bedrooms set in a peaceful tranquil position and furnished to Visit Wales' 5 Star standard. It is ideal for a couple or two couples sharing to rent, all rooms on ground floor level. There is a large kitchen/diner with spectacular sea views over Moelfre Bay and Penmon which is fully equipped with washing machine, dishwasher, fridge/ freezer, cooker, hob and microwave. It is fully heated with a wood burning stove for those cold Winter cosy nights in. It also has the benefit of solar panels. There is a double bedroom en suite with shower and a twin bedroom with a main bathroom next door with bath and shower over the bath. Both rooms have television/DVD. There is a lovely seating area overlooking the sea and Countryside. Parking is private and right outside the property. Full week bookings for Y Bwthyn are from Saturday to Saturday. 31.8.10 Excellent accommodation. Fantastic hosts, beautiful place recommended trip Llanddwyn Island & Moelfre Chippy!!!! 09.08.13 First class accommodation. Great hosts, marvellous views. Feel we have had a holiday. 09.09.13 Had a wonderful stay. Facilities are great really enjoyed the log fire, very beautiful views. All properties are available from 3.30 pm. on day of arrival.